One of the most common complaints I hear from caregivers about men- men who may or may not have dementia- is that they frequently miss the toilet when urinating, and even the best potty seat and chair doesn’t seem to help. This can result in some splashing on the seat (inconvenient, unpleasant) or in a large puddle on the floor (slip hazard, sticky shoes). 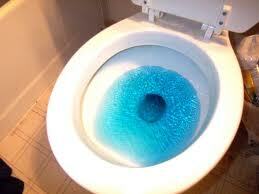 Wet bathroom floors are a big contributor to falls. Caregivers around the world cry,“Why won’t he just sit?”. Anatomically speaking, standing is just the most natural position. 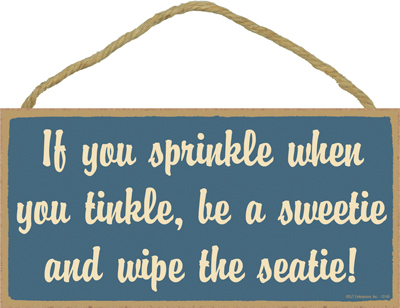 In the presence of dementia, sometimes verbal reminders are just not enough to keep the urine stream aimed at the toilet bowl. In fact, sometimes men urinate into corners, garbage cans, or potted plants- seemingly aiming at something. This issue can be a real challenge for caregivers. Because it is highly unlikely that someone in the middle stage of dementia can learn a new technique (i.e. sitting on the toilet to urinate), modifications to the environment that may improve “aim” is usually the best course of action. 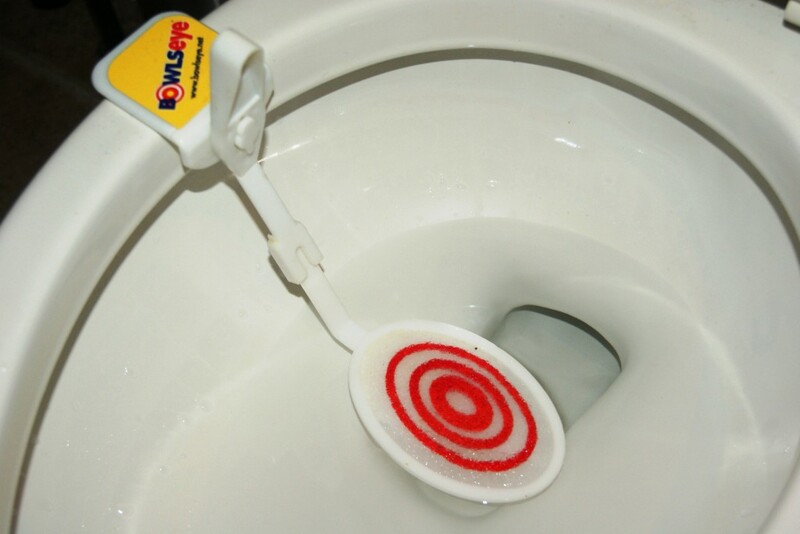 Adding contrast to the water against the white toilet bowl by placing a hanging toilet bowl cleaner in the tank provides a much brighter target. 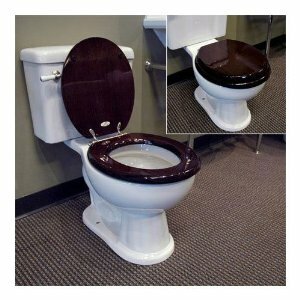 Other contrasts might include a darker toilet seat or even painting the walls around the toilet a darker or brighter color so that the toilet stands out. Men (and boys) love a good target. It brings out their competitive spirit. This is the Bowlseys. It’s symbolism taps into an innate desire to “win”. And if he wins, everybody wins. 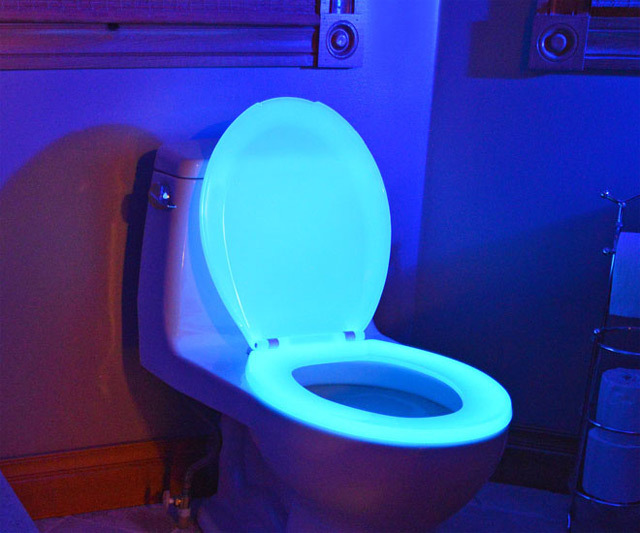 Ditto for the LED Toilet Seat Light. A cautionary note: green means “go”. Keep the seat up for the red bullseye projection. This seat is hard to miss. It may look more like a futuristic flying saucer than a toilet seat, but it’s at least a curiosity that will draw attention to the right location. Available at NightGlow. Be on the lookout for frequent urination or a change in mental status that may be related to a medical issue such as a urinary tract infection or prostate problems. Do not discourage fluids as a way of controlling the water works- proper hydration is imperative. A well lit path to bathroom, free from clutter or distractions, is also helpful. 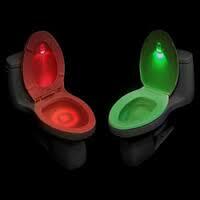 For these and other Toilet Target products, check out the Dementia Queen Store on Amazon. Would love to chat with you some more. 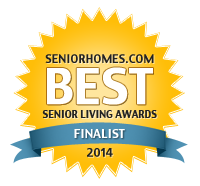 I am an executive director and licensed nursing home administrator for an Alzheimers facility in Fort Worth Texas. Not sure where you are located but always looking for resources and reaching out to others that can help educate my family members of residents and also my staff. Men of that age are also less likely to sit because with prostatic hypertrophy it is harder to both start the stream and empty the bladder in the seated position. Your solutions are clever and far more likely to work. 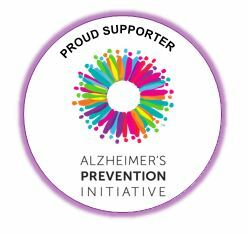 I have been a homehealth CNA since march of 2009 I currently work for 5 agencies and deal with many Alzheimer & Dementia cases. I usually try to get them to turn around and sit down if I am told by family that he has bad aim. More times than not by talking to them in a softer voice and firm and direct suggestions usually give good results. Gosh that is such a great reminder David, and one so easily overlooked. Communication is everything. I would be interested in tips for women who drizzle. My Mom can still toilet herself and is continent–she makes it to the bathroom, and sits, and urinates. Most of the time, she rises and wipes herself, redresses, washes her hands, and exits the bathroom. But sometimes (without any rhyme or reason), she ends up peeing on the toilet seat as she stands up to wipe herself. As a consequence, she somehow ends up dragging her clothing through the urine as she pulls her PJs or slacks up–OR, if she manages to avoid that disaster, ends up sitting in it the next time she goes. I can’t always be around to cue her. She attends adult day care, where they cue her. But I am really tired of getting up every two hours each night when the motion detector alarm rings just to be able to wipe a toilet seat. Sometimes she gets up 3 times in one hour! Any ideas? JL, I have not ignored your question. It’s just such a great question, and a common, exhausting issue for caregivers. I am also gathering thoughtful opinions from my peers. I’ll get some ideas to you soon! Is it better to just let it happen, and deal with the consequences? Or hire someone to help overnight (she can’t find the bathroom by herself, she gets confused–which is a whole other question of course!)? I am soooo tired. I catch myself nodding off at the wheel several times a week.